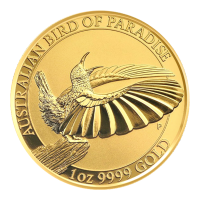 Order your 1 oz 2018 Australian Bird of Paradise gold coin from our store online today for the web’s lowest price. This celebration of one of northeastern Queensland’s aviary treasures, the bird of paradise, is proudly brought to you by Australia’s oldest and most prestigious mint. This coin’s dazzling reverse features a majestic bird of paradise, wings outstretched and long beak open in a call, perched atop a log, all shown in meticulous detail, against a field of sandblast texturing. Within a simple border with a polished texture, also on the reverse, details of metal weight, purity and content. The coin’s obverse feature, also set against a sandblast textured field, is an exquisite artist’s rendering of Elizabeth II, shown in profile, wearing her beloved Girls of Great Britain tiara. Elizabeth’s name, as well as the country of origin, year of origin and unique, $100 denominational value are also to be found on the obverse. Queensland’s birds of paradise are best known for the dazzling call and wing displays of the male members of their species. Celebrate the wonders of nature and fortify your holdings with a1 oz 2018 Australian Bird of Paradise gold coin today. Obverse Ian Rank-Broadley's Elizabeth II portrait and the words " Australia 2018"followed by the the 100 Dollar denomination. 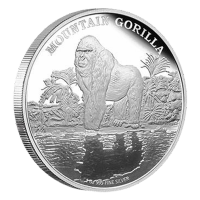 Reverse The Victoria Rifle bird of paradise followed by the coins weight, purity and content. Ian Rank-Broadley's Elizabeth II portrait and the words " Australia 2018"followed by the the 100 Dollar denomination. The Victoria Rifle bird of paradise followed by the coins weight, purity and content. 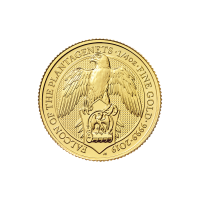 1 oz 2018 Australian Bird of Paradise Gold Coin Order your 1 oz 2018 Australian Bird of Paradise gold coin from our store online today for the web’s lowest price. This celebration of one of northeastern Queensland’s aviary treasures, the bird of paradise, is proudly brought to you by Australia’s oldest and most prestigious mint. This coin’s dazzling reverse features a majestic bird of paradise, wings outstretched and long beak open in a call, perched atop a log, all shown in meticulous detail, against a field of sandblast texturing. Within a simple border with a polished texture, also on the reverse, details of metal weight, purity and content. 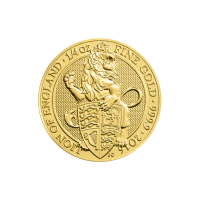 The coin’s obverse feature, also set against a sandblast textured field, is an exquisite artist’s rendering of Elizabeth II, shown in profile, wearing her beloved Girls of Great Britain tiara. 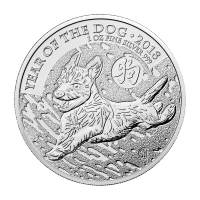 Elizabeth’s name, as well as the country of origin, year of origin and unique, $100 denominational value are also to be found on the obverse. Queensland’s birds of paradise are best known for the dazzling call and wing displays of the male members of their species. Celebrate the wonders of nature and fortify your holdings with a1 oz 2018 Australian Bird of Paradise gold coin today.